SAN JOSE, Calif.--(BUSINESS WIRE)-- Cypress Semiconductor Corp. (NASDAQ: CY), the leader in advanced embedded system solutions, today announced that it has collaborated with ESCRYPT, a leading IoT security provider and member of the Bosch group, to offer a secure microcontroller (MCU) solution for applications using the LoRaWAN™ open protocol. ESCRYPT has integrated their secure LoRaWAN key provisioning and management application programming interface (API) with Cypress' PSoC® 6BLE MCU so customers can easily protect and manage their LoRaWAN keys and deploy a secure LoRaWAN-based system quickly. The PSoC 6 BLE MCU is the industry's lowest power, most flexible dual-core MCU with built-in Bluetooth Low Energy (BLE) wireless connectivity and hardware-based security, including an isolated-execution environment, secure-element functionality and an accelerated cryptographic engine. Smart city and industrial Internet of Things (IoT) applications that leverage the LoRaWAN network require processing for sensor aggregation, control actuation and for operation of the radio stack. The radio stack utilizes two Advanced Encryption Standard AES-128 cryptographic keys for security operations—one to authenticate packet data to the network server and one to decrypt the packet when it arrives at the application server. Cypress' PSoC 6 MCUs ensure that these keys are only used by crypto operations and are not accessible by other programs. The radio stack conducts signing and encrypting in the MCUs' isolated execution environment, protecting sensitive information. In addition, the PSoC 6 MCUs' secure boot capability ensures that they power up in a secure state. Along with these security features, PSoC 6 MCUs provide BLE for off-channel communication and additional processing capacity that can be used for sensor hub functionality, providing a one-chip LoRaWAN host MCU. "When we looked around the IoT MCU universe, we identified Cypress' PSoC 6 as the ultimate low-power, secure MCU to match with the LoRa radio," said Tony Rosati, ESCRYPT's Director of IoT Security Solutions. "PSoC 6 MCU-based LoRaWAN-based modules will provide our customers with everything they need to bring secure IoT solutions to market quickly." The ESCRYPT LoRaWAN Key Management System (KMS) is a Cloud based security service for lifecycle key management in any LoRaWAN ecosystem. It is use used to securely provision and register devices onto any LoRaWAN network and to securely store keying material for the LoRaWAN ecosystem. Keying material is never exposed and only authorized users gain access to sensitive IoT data. "Edge devices that use Semtech's LoRa® devices and wireless radio frequency technology (LoRa Technology) need to be secure and protect the data that they generate and process," said Jack Ogawa, senior director of marketing for the MCU Business Unit at Cypress. "PSoC 6 MCUs protect encryption keys and provide isolated execution environments for secure operations, and therefore can be the cornerstone for a secure LoRa-based device that service providers can trust. Cypress and ESCRYPT together provide an end-to-end security solution, from silicon to cloud-based key management." Cypress and ESCRYPT are demonstrating a secure PSoC 6 MCU-based LoRa-based module from partner Onethinx that connects to the Cross Domain Development Kit (XDK), a smart and wirelessly transmitting multi-sensor module by Bosch Connected Devices and Solution GmbH. The XDK records sensor data such as vibration, orientation, temperature, light intensity or barometric pressure from Micro-Electromechanical Systems (MEMS) sensors and uses the ESCRYPT provisioning system to securely connect to the Onethinx LoRa-based application server. The demonstration will be in the ESCRYPT booth number D04 at the Bosch Connected World conference in Berlin, Germany from February 21 to 22. Cypress will also be showcasing this demo, along with its complete embedded systems solution portfolio, at the Embedded World trade show in Nuremberg, Germany in hall 4A, stand 148 of the Nuremberg Exhibition Center from February 27 to March 1. PSoC 6 is the industry's lowest power, most flexible MCU with built-in Bluetooth Low Energy wireless connectivity and integrated hardware-based security in a single device. Software-defined peripherals can be used to create custom analog front-ends (AFEs) or digital interfaces for innovative system components such as electronic-ink displays. The architecture offers flexible wireless connectivity options, including fully integrated Bluetooth Low Energy (BLE) 5.0. 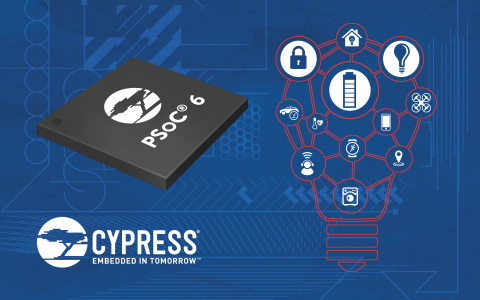 The PSoC 6 MCU architecture features the latest generation of Cypress' industry-leading CapSense® capacitive-sensing technology, enabling modern touch and gesture-based interfaces that are robust and reliable. The architecture is supported by Cypress' PSoC Creator™ Integrated Design Environment (IDE) and the expansive Arm ecosystem. Designers can find more information on the PSoC 6 MCU architecture at http://www.cypress.com/PSoC6. Cypress is the leader in advanced embedded system solutions for the world's most innovative automotive, industrial, smart home appliances, consumer electronics and medical products. Cypress' microcontrollers, analog ICs, wireless and USB-based connectivity solutions and reliable, high-performance memories help engineers design differentiated products and get them to market first. Cypress is committed to providing customers with the best support and development resources on the planet enabling them to disrupt markets by creating new product categories in record time. To learn more, go to www.cypress.com. ESCRYPT is a leading system provider for IoT security in the domains of smart mobility, smart city and smart industry. With locations in Germany, the UK, Sweden, the USA, Canada, China, Korea, and Japan we have security specialists available to help with current security topics such as secure M2M-communication, IT-security in the Internet of Things, protection of e-business models and automotive, enterprise and operational IT security. ESCRYPT develops highly secure, worldwide valued products and solutions which are tailored to the specific requirements of embedded systems and the relevant IT-infrastructure and are tested and proven a million times in automotive series production. ESCRYPT is a subsidiary of ETAS GmbH, a wholly owned subsidiary of the Bosch Group. For more information, visit www.escrypt.com. Bosch Connected Devices and Solutions GmbH has been founded 2013 as a fully owned subsidiary of Robert Bosch GmbH. The company develops and markets smart connected devices and tailor made solutions for the Internet of Things. Leveraging on its competences in electronics, sensor technology and software development, Bosch Connected devices and Solutions offers new business models to the global IoT market. the company is headquartered in Reutlingen, Germany with offices in Chicago(USA), Shanghai (China) and Singapore. For more information, please visit www.bosch-connectivity.com, xdk.io, twitter.com/bosch_BCDS. Onethinx specializes in full service IoT development solutions, with a focus at LoRaWAN network. We follow pragmatic procedures resulting in attractive and user-friendly applications. We offer off-the-shelve and tailor-made applications based on our overall conceptual and technical approach. Building on optimized concepts and technical innovations, backed up with over 15 years of experience in the field of electronics, mechanics, software and communication & marketing. Cypress, the Cypress logo, PSoC, CapSense are registered trademarks and PSoC Creator is a trademark of Cypress Semiconductor Corp. All other trademarks are property of their owners.